Exactly as described. It looks so great on our iron bed. Super comfy looking, love the farmhouse looks it gives. Great price and shipped quickly. A superb complement to any bedroom aesthetic, this beautiful comforter set features a pin tuck design and pleasant off-white color. Made of durable and cozy polyester microfiber, this generously sized set has thick, plush inner fill that's excellent for staying comfortable and regulated while you sleep. I was looking for a cream comforter for my master bedroom to match some curtains I actually purchased from Overstock. This comforter is not too thick so it can be used year round. I have not washed the comforter so I am not sure how it will hold up after a wash. However, because of the pin tucks, I would suggest dry cleaning. 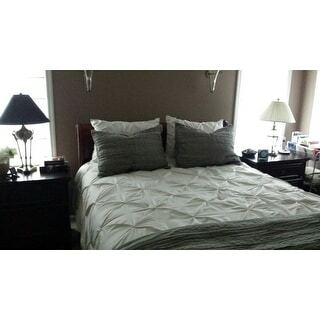 Lastly, the comforter is beautiful and elegant and I highly recommend. My daughter wanted this for her bed in her dorm. Couldn't be more pleased. This was exactly what she was looking for. Love love this comforter. It's beautiful and luxurious! It's not stark white, which is exactly what I wanted! My only complaint is that it arrived as a queen XL, which I still don't see in the description or choices. It's a little long, but still beautiful and keeping it! Comforter was bought to replace a another similar to this. Great warm comforter for cold winter nights. Great quality love the color. Very subtle. This is exactly what I was looking for. It is a soft ivory color not a bright white. The fabric is soft. It looks like a beautiful cloud in my bedroom! The package arrived on time, too. Nice comforter but wasn't the color I was hoping for. Looked more yellow than in the photo. Sent it back. This comforter is very plush and looks more expensive than it is. Very happy with this purchase. I would highly recommend. Looks great in my teens room. This is a great comforter. It is just as it looks in the picture. This looks exactly how the picture shows! Feels good to lay on at night! "What color s the actual bedding set"